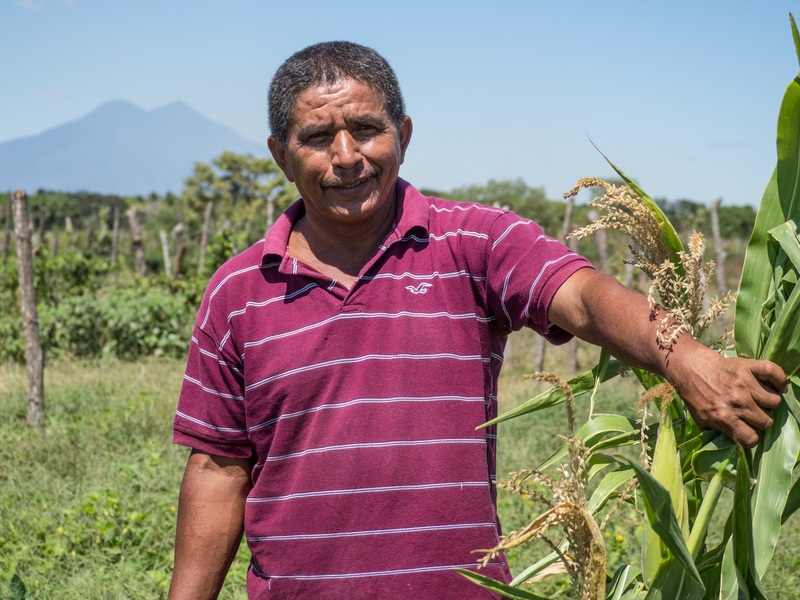 We are learning how to manage our crops better,” say farmers Malvin Ortiz and Felipe Martínez, “and we are teaching our children how to do it, too.” Now, the future is looking more hopeful. The lingering effects of El Niño have affected around 7 million people in Latin America and the Caribbean. Right now, 3.5 million people in Guatemala, Nicaragua, Honduras, and El Salvador do not have enough to eat, after drought has devastated several cycles of crops. Oxfam and its local partners have been helping some of the most vulnerable people in the region to become more resilient to extreme weather patterns. As part of a multi-year resilience program (funded by the Margaret A. Cargill Foundation), we have been supporting farmers in the community of El Ranchon, La Herradura in El Salvador grow crops successfully, despite drought conditions that have damaged and destroyed harvests elsewhere in the country. Filipe Cordova, a farmer in El Ranchón, displays corn that is thriving in drought-stricken El Salvador, thanks to our resilience program. The program has helped farmers swap out toxic chemical inputs for cheaper and safer organic fertilizers and pesticides and, in coastal areas, take advantage of a third growing season. “We are learning how to manage our crops better, and we are teaching our children how to do it, too. It’s a relief not to have to train them to use poisonous chemicals," says Filipe, a beneficiary of the program. He explains what working with the chemical fertilizers was like, “it would affect our brains and our bodies. I would feel dizzy and get a headache…the chemical would spill onto my back, and I broke out in rashes. With organic fertilizer, it’s different. The future looks more hopeful," he finishes. As well as encouraging the use of homemade organic fertilizer, we supported farmers to change the timing or their cultivation and, near the coast where the water table is not too low, farmers have also planted during a third planting season to increase annual yield. Another facet of the program involves growing kitchen gardens to improve nutrition and diet variety. With new input and techniques, the farmers were able to grow successful gardens and extend the growing season beyond its normal duration. Farmer Flor Aquino displays corn grown on a community plot in El Ranchón, as part of a program focused on building resilience to drought. 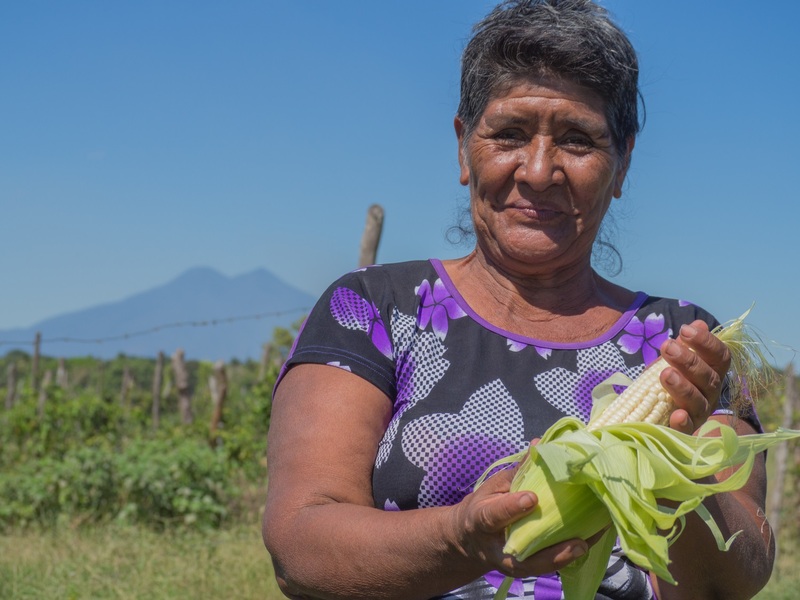 While the country is reeling from the effects of El Niño, corn and beans are thriving here. The program has changed the way Flor works in her garden, "I have always grown things, but in the past I didn’t use fertilizer. Now, my garden is much more productive, and the growing season is longer than before. My tomatoes used to last only a month, but this time they lasted three months. "Healthy gardens are what I see in the future," she ends. The resilience program also looks to the future by developing early warning systems and community savings groups, as well as strengthening the capacity of local government to do rapid assessments at times of emergency. Ethiopia, alongside Kenya and Somalia, is suffering from a catastrophic drought that has led to a humanitarian crisis. Millions of people are facing acute food and water shortages, and are in urgent need of emergency assistance. Your support now will help us save more lives.